Whistler Vancouver Airport transfers with style and personal service. Local Whistler office and personal service for your transportation needs. Ride in style on your next Whistler trip... depending on your group size, you may enjoy a private charter for less than the price of the basic Whistler shuttle bus. Whistler is 75 miles (120 km) north of Vancouver. Airport transfer time via road is two and a half hours, by air thirty minutes. The Pacific Ocean and the Coastal mountains make for breathtaking scenery. A luxurious black 4�4 Suburban XL offering private, customized service between Whistler and Vancouver, BC. Whistler Wired Vacations Inc. is fully licensed by the British Columbia Ministry of Transportation for commercial transportation and holds $10 million CAD in insurance liability. * Rates subject to 12% Tax. Driver gratuity not included. Reserve Now - Please include dates, time, and number of guests. 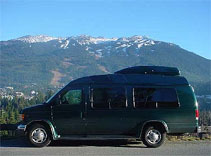 A custom-designed small bus offering private, customized service between Whistler and Vancouver. Pacific Coach Lines PCL is proud to be the official bus transportation service between Vancouver International Airport (YVR) and Whistler Village. Pacific Coach's YVR-Whistler SkyLynx, is a direct transportation service between Vancouver International Airport (YVR) and Whistler Village, BC. PCL is the only bus transportation company with ticket counters located at the Domestic and International Arrivals areas of Vancouver International Airport (YVR). During our peak snow season, they offer twelve daily departures in both directions with an hourly service during peak hours. Throughout the remaining year, regular scheduled service will provide you with a minimum of seven daily departures in each direction. The fastest most direct form of transportation between Whistler and Vancouver is Helijet. Departures from Vancouver International Airport (YVR) and Vancouver Harbour Heliport. Travel time to Whistler is a brief 30 minutes with breathtaking views of the Coast Mountain Range and the Pacific Ocean. Imagine speeding across the water and effortlessly lifting into the air while sitting in the comforts of a float plane. Enjoy an enchanting 30 minute flight over the Lion's Gate Bridge, past West Vancouver, and Garibaldi Park to Whistler. 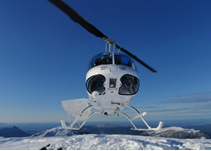 Enjoy spell binding views as you soar over the Coast Mountain Range and the Pacific Ocean. Float planes fly daily from April until November as we can�t land on frozen lakes in the winter season.